Each summer we keep a close eye on the Great Barrier Reef as this time of the year presents the highest risk to the ecosystem from thermal stress, rainfall and floods, cyclones and storms, and outbreaks of crown-of-thorns starfish. At the beginning of this summer, the ongoing outbreak of coral-eating crown-of-thorns starfish and possible marine heatwaves were the biggest concerns for the Reef. The cooler regional weather in January and early February has seen the threat of mass bleaching reduced markedly for most of the Reef from predictions earlier this summer. Our climate is changing year-by-year and this is causing changes in the Reef ecosystem — it’s under pressure which makes the Reef more vulnerable to possible impacts particularly over summer and cyclone season. With a changing climate — we’ll keep watch on the Reef over summer and cyclone season and encourage anyone out on the water to report reef condition through our Eye on the Reef app. Reduced salinity levels continue to persist south of Lockhart River in the far north, particularly around Princess Charlotte Bay. Salinity levels between Cooktown and Bowen remain below average, although appear to be returning to normal levels. Sea surface temperatures are still slightly above average in areas north of Cooktown and south of Mackay. Sea surface temperatures throughout the remainder of the Marine Park are average. An El Niño ALERT remains, with models predicting a 70 per cent chance of El Niño developing by mid-2019. However, if it does develop, it is likely to be relatively weak and short-lived. Reduced salinity levels continue to persist south of Lockhart River, particularly around Princess Charlotte Bay in the far northern management area of the Great Barrier Reef. For inshore regions between Cooktown and Bowen salinity levels are still low, although appear to be returning to normal levels. Sea surface temperatures continue to be slightly above average throughout the Marine Park, particularly for the far northern area where sea surface temperatures are 1–2°C above average, and also the region south of Mackay where temperatures are 0.5 – 1°C above average. An El Niño alert remains, with models predicting a 70 per cent chance of El Niño developing by mid-2019. This is around triple the normal likelihood. Tropical cyclone Trevor caused substantial flooding in several river systems in the far northern management area of the Great Barrier Reef Marine Park. Some rivers, like the Normanby and Pascoe rivers, reached their highest flood height on record (since 1960s). Satellite imagery shows plumes reaching mid-shelf reefs around the Lockhart River region, and significantly lower than average salinity levels were recorded by the Marine Monitoring Program at mid-shelf reefs off Cooktown. Pictured is a satellite image of the Princess Charlotte Bay area that shows visible flood plumes (image from NASA’s site via EOSDIS Worldwiew Rapid Response System, 24 March 2019). Sea surface temperatures continue to increase throughout the Marine Park this week, with sea surface temperatures being 1-2°C above average, particularly in inshore areas from Cooktown to Rockhampton. An El Niño alert remains, with models predicting a 70 per cent chance of El Niño developing by mid-2019 — this is around triple the normal likelihood. Preliminary modelling by the Australian Institute of Marine Science indicates that Tropical cyclone Trevor was a small and intense system which moved slowly across the far northern section of the Marine Park before making landfall south of Lockhart River. There is a moderate risk of damage to coral reefs in the region between Lockhart River and Princess Charlotte Bay near Cooktown. The system also brought heavy rains to the Cape York region, with several rivers experiencing major flooding. Modelling and satellite imagery has indicated that flood plumes have led to reduced water clarity and salinity in the inshore region between Princess Charlotte Bay and Lockhart River. Marine Monitoring Program teams are scheduled to undertake water quality monitoring in the affected region in the coming week. Tropical cyclone Trevor crossed through the Marine Park, making landfall on the Queensland coast south of Lockhart River as a category three system on 19 March 2019. The system brought destructive winds and heavy rains to the far northern Marine Park. Flood warnings were issued for the Daintree and Mossman rivers, as well as a broader flood watch for catchments north of Innisfail to Kowanyama, on the Gulf of Carpentaria side of Cape York Peninsula in far north Queensland. The Marine Park Authority is currently working with the Australian Institute of Marine Science to generate a predictive model of the likely wave damage to coral reefs as a result of the cyclone. The ENSO outlook has moved from El Niño WATCH to El Niño ALERT — chance of El Niño developing in 2019 has increased to approximately 70 per cent. An El Niño occurs when sea surface temperatures in the central and eastern tropical Pacific Ocean become substantially warmer than average, and this causes a shift in atmospheric circulation. In Australia, El Niños are usually associated with reduced rainfall and warmer temperatures. The Bureau of Meteorology provides detailed information on what an El Niño could mean for Australia. With summer over, there is no longer the threat of mass coral bleaching from thermal stress. The risk of another severe weather event is also unlikely. With these threats from summer over, we will now post our Reef health updates on a fortnightly basis. 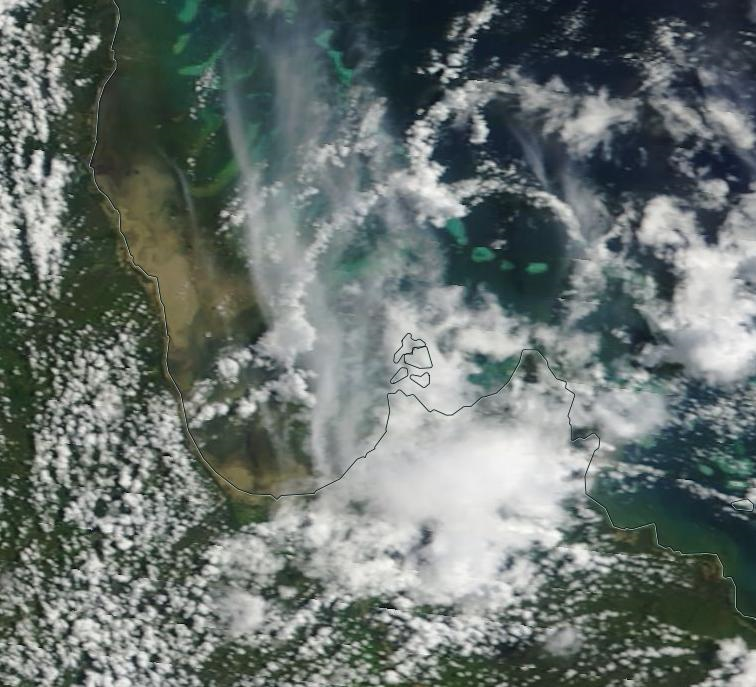 The unprecedented flood event in North Queensland resulted in flood plumes extending out to the Great Barrier Reef. While there have been widespread reports of isolated colonies of coral bleaching, there are no reports of significant impacts and few coral mortality. In late February, cyclone Oma brought significant wind and waves in parts of the southern Great Barrier Reef. We do not have any detailed reports of this area – however, the reports we have received shows no significant impacts from this weather event. At the beginning of this summer in 2018, coral-eating crown-of-thorns starfish, possible marine heatwaves and cyclones were the biggest concerns for the Reef. Early in 2019, a monsoon caused unprecedented levels of rain and flooding in north Queensland, particularly around Townsville and other catchments adjacent to the Reef. This has been a focus of monitoring over the last month. Our assessment of the recent flood plumes continues with teams closely monitoring salinity and visibility. In-water surveys in some areas have been limited due to recent weather conditions and poor water clarity. However, salinity levels are beginning to return to normal in parts of the Marine Park, including Princess Charlotte Bay near Cooktown. In the worst affected region between Cooktown and Bowen, salinity and visibility levels in the inshore areas remain significantly reduced. Salinity levels also appear to be reduced on some mid-shelf reefs. Reports indicate that visibility on some of these reefs has improved since mid-February. Our initial reports have indicated there are no significant impacts to the inshore reefs with only patchy and minor bleaching. In the inshore areas of the Townsville region there are signs of localised coral bleaching and/or mortality, as well as a reduction in macroalgae. We are still undertaking surveys and monitoring these near-shore environments to determine the extent and severity of these impacts on the corals. We will continue to report on this and will provide an update in our next Reef Health update. While we are now into March, we will continue to keep a close eye on the Reef and publish these updates over the coming weeks. It is still possible to have warmer sea surface temperatures causing thermal stress and it is still the cyclone season. As we move from the end of summer, there’s been no significant coral bleaching on the Reef. Current sea surface temperatures are generally average, or slightly below average, throughout the Marine Park. The exception is patches of slightly warmer than average water between Princess Charlotte Bay and Townsville. River levels throughout the catchment are reduced to below flood level, however salinity levels are still reduced in the region between Princess Charlotte Bay and Mackay. The recent flood plumes are still being assessed. Incoming reports have indicated some signs of localised coral mortality on some inshore reefs as a result of lowered salinity levels. March to May 2019 is predicted to be characterised by higher than average temperatures and lower than average rainfall. Regional and local weather conditions over this period will continue to play a role in determining the outcome for the Reef. The cooler regional weather in January and early February 2019 sees the threat of any mass bleaching from thermal stress reduced markedly for the Reef. While the southern half of the Marine Park remains cool, there are some rises in sea surface temperature in patches within the northern half of the Marine Park. Higher temperatures and low rainfall are still predicted for the remainder of summer. Regional and local weather conditions over the remainder of summer continue to be critical in determining the outcome for the Reef this summer. Satellite salinity readings and visible observations show flood plumes did extend out to mid-shelf reefs and beyond between the Daintree and Burdekin rivers. Although reduced, freshwater outflows continue for the larger river systems. The extent of the associated flood plumes is being assessed by teams from the James Cook University (TropWater). The Australian Institute of Marine Science and the University of Queensland are also monitoring water quality as part of our Marine Monitoring Program. Inshore ecosystems — including seagrass meadows and inshore corals — are mostly like to be impacted. The immediate and longer term impact from the flood plumes on any mid-shelf and offshore reefs will depend on the duration of this freshwater inundation, the drop in salinity it causes, and the sediment, nutrient and chemical compounds it deposits on any reefs. There is likely to be a time-lag of weeks to many months before we start to see impacts on marine turtles and dugongs in areas where seagrass meadows experience dieback or die-off. A recent monsoon caused unprecedented levels of rain and flooding in north Queensland, particularly around Townsville and other catchments adjacent to the Reef. Townsville, for example, received more than its average annual rainfall over seven days. Flood plumes are visible by satellite from the Daintree to Mackay and also around Princess Charlotte Bay. The plumes extend out to mid shelf reefs in locations where flood flows were heaviest. Fresh water continues to flow from these river systems, including the Burdekin River, to the ocean. The extent of the associated flood plumes is being assessed by teams from James Cook University (TropWater). The Australian Institute of Marine Science and the University of Queensland are also monitoring water quality. These programs are part of our Marine Monitoring Program. With clear skies this week satellite observations show most of the Reef has average to below average sea surface temperatures. There is a noticeable cooling in the far north of the Reef above Princess Charlotte Bay. There are, however, some rises in sea surface temperature in patches within the Marine Park as a result of the clearer and warmer weather. The flooding is likely to affect water quality and light penetration, which can impact seagrass meadows. Therefore, there’s concerns for animals like green turtles and dugongs that feed on seagrass. People out on the water are encouraged to go slow in areas where dugongs are found. Sick, injured or dead marine animals can be reported to RSPCA QLD on 1300 ANIMAL (1300 264 625). Our thoughts are with everyone in north Queensland impacted by the severe weather that occurred in the region. A monsoon trough (in association with a tropical low) currently extends across north Queensland and into the north-western Coral Sea. There’s been unprecedented levels of rain and flooding, particularly around Townsville and other catchments adjacent to the Reef. Cloud cover has been extensive over the northern and central sections of the Marine Park over the last couple of weeks. Some areas — particularly Cape York Peninsula and the area between the Wet Tropics and Mackay — received significant rainfall. Townsville, for example, received more than its average annual rainfall over seven days. There has been major to moderate flooding of rivers from the Daintree to the Mackay region. Flooding — and the discharge of large amounts of freshwater into the Marine Park — can result in freshwater bleaching to inshore reefs and impacts to seagrass meadows. At this stage it is too early to determine the impact from the flood waters. We’ve received anecdotal reports of flood plumes off the coast of the Daintree—Cairns region. The Marine Monitoring Program flood plume monitoring teams are currently in the area, and preparations are also underway to monitor further potential flood plumes. Species like green turtles and dugongs that rely on seagrasses as their primary food source are likely to be affected in those areas exposed to significant flooding. Following previous significant flood events — such as tropical cyclone Yasi in February 2011 — there was a dramatic increase in recorded mortality of these species. There is likely to be a time-lag of weeks to many months before we start to see impacts to these animals. In response to likely declines in seagrasses, we may also see green turtles and dugongs in areas where they’re not usually found. Fishers and other users that operate vessels around inshore waters should keep an eye out for these animals and report unusual behaviour or sightings directly to us or by using the Eye on the Reef app. Report sick, injured or dead marine animals to RSPCA QLD 1300 ANIMAL (1300 264 625). Based on the extensive cloud cover over north Queensland from the monsoon trough, satellites that measure sea surface temperature are unreliable in this region. Based on available tools and for those areas unaffected by cloud cover, sea surface temperatures throughout the Marine Park remain around average or below average for this time of year. Forecast models still predict above average sea surface temperatures through the remainder of February and March for the entire Reef. However, the cooler regional weather in January and early February saw the threat of mass bleaching reduced markedly for most of the Reef from predictions earlier this summer. Regional and local weather conditions over the remainder of summer continue to be critical in determining the outcome for the Reef this summer. Sea surface temperatures remain around average or below average for this time of year throughout the Great Barrier Reef Marine Park, with the exception of the northern part of the Far Northern management area of the Marine Park (above Princess Charlotte Bay) where temperatures are 0.5 – 1.5°C above average. Localised instances of minor bleaching have been reported from all regions of the Marine Park since the start of summer, particularly in the northern half of the Reef. Forecast models still predict above average sea surface temperatures through February and March for the entire Reef. However, the cooler regional weather in January has seen the threat of mass bleaching reduced markedly for most of the Reef from predictions earlier this summer. The very far north remains an area with potential for thermal stress to continue. The impending monsoon activity over northern Australia in the coming few days will likely bring some cooler conditions to the far northern Marine Park and will extend further south. Sea surface temperatures remain around average or below average for this time of year throughout the Marine Park, with the exception of the Far Northern management area of the Marine Park (above Princess Charlotte Bay) where temperatures are 0.5 – 1.5°C above average. While rainfall and cooler conditions brought some reprieve to parts of the Marine Park, the Far Northern, Northern and Central management areas (from approximately Townsville northwards) are currently on bleaching watch. Forecast models still predict above average sea surface temperatures through February and March for the entire Great Barrier Reef. Tropical cyclone Penny peaked as a Category 2 system in the Coral Sea on 3 January 2019 before downgrading to a tropical low and turning back towards the Queensland coast. The system entered the Marine Park and crossed the coast around the Bowen region on 9 January 2019. Heavy rainfall (and associated cloud cover) affected parts of Eastern and Central Queensland. This helped to cool sea surface temperatures over most of the Marine Park down to average or slightly below average, and decreased the current risk of coral bleaching across much of the Reef. As a result much of the Marine Park is currently no longer on bleaching watch, apart from the Far Northern management area (above Princess Charlotte Bay). While this cooling effect has provided relief in many areas in the Marine Park, a close watch for bleaching and other impacts will be maintained. Heat waves across Queensland during December 2018 saw a rapid accumulation of thermal stress in sea surface temperatures. As a result corals in some parts of the Reef, particularly in the Northern and Far Northern regions, may still be experiencing the impacts of that heat stress, despite the recent short period of relief from above average temperatures. Regional and local weather conditions over the remainder of summer continue to be critical in determining the outcome for the Reef this season. Since our last update on 20 December 2018, another tropical low crossed into the Marine Park from the Coral Sea before crossing into the Gulf of Carpentaria in late December 2018. Once in the Gulf, the system strengthened and changed direction back towards the Cape. On 1st January 2019, this low pressure system became Tropical Cyclone Penny (Category 1) and crossed the coast on the Cape between Weipa and Thud Point, before quickly downgrading to an ex-tropical cyclone. After crossing over the Cape and back through the Marine Park as a tropical low, the system moved back into the Coral Sea and Tropical Cyclone Penny was reborn on 2nd January 2019. The tropical low brought heavy rain to Cape York Peninsula and the Wet Tropics region, resulting in minor to moderate flooding of rivers. The recent rainfall and cloud cover has cooled sea surface temperatures back down to average or slightly below average throughout most of the Marine Park. The exception is the far northern Marine Park where above average temperatures and thermal stress accumulation have persisted. In water surveys in the far north and north in late December 2018 showed some minor bleaching of individual coral colonies on reefs. Tropical Cyclone Penny (Category 2) is currently in the Coral Sea well offshore of mainland Australia, however it is forecast to change direction back towards the Queensland coast over the weekend. While there is still uncertainty about the track it will take, the system is expected to weaken as it draws closer to Queensland in the early part of next week. We will continue to monitor this system closely. Since our last update on 6 December 2018, ex-tropical cyclone Owen (in the form of a tropical low) crossed into the Marine Park from the Coral Sea before crossing into the Gulf of Carpentaria and reforming as a cyclone on 11 December 2018. This update relates mostly to cyclone impact and rainfall. After reforming, tropical cyclone Owen tracked west across the Gulf of Carpentaria, intensifying to a category three system before changing direction and tracking eastwards. Cyclone Owen crossed the southeast Gulf of Carpentaria coast between Kowanyama and the Gilbert River mouth as a low end category three system early on 15 December 2018. The system weakened to a tropical low soon afterwards as it tracked east southeast across the northern interior of Queensland. Upon reaching Queensland's east coast, the system adopted a southerly track, roughly parallel to the coast. As of 19 December 2018, the tropical low was located off of the central Queensland coast. Wind speeds significantly decreased as the system moved over land, however ex-tropical cyclone Owen still brought heavy rainfall to some areas. The highest rainfall totals were recorded between the Cairns and Mackay regions. Notably, the Halifax area (near Ingham) received 681mm in 24 hours, the highest 24 hour rainfall total ever recorded in Australia during the month of December. River levels in the areas affected by heavy rainfall briefly increased, however the majority remained below flood level and there was no major flooding in the catchment. As a result of the increased freshwater runoff and heavy rainfall, salinity levels declined in the inshore waters between approximately Tully and Townsville. As the cyclone only affected the Reef as a tropical low, no major wave damage impacts to coral are anticipated. The cloud cover and rainfall associated with ex-tropical cyclone Owen cooled sea surface temperatures back down from above average to average levels in the central region of the Marine Park. However, in other areas such as the far northern Marine Park, above average temperatures and thermal stress accumulation have persisted. The El-Niño Southern Oscillation is currently neutral, bordering on an El Niño event. The Bureau of Meteorology’s (the Bureau) December 2018 to February 2019 seasonal outlook for Queensland indicates that the state will experience above average temperatures, with average rainfall in the Great Barrier Reef catchment. While it is yet to fully develop, El Niño conditions may result in marine heatwaves and below average rainfall this summer — these are the conditions that can lead to bleaching. The Bureau’s predictive modelling for the Great Barrier Reef indicates that sea surface temperatures are likely to be above average over the next three months, with thermal stress accumulating throughout the majority of the Marine Park. As of the start of summer, sea surface temperatures are above average throughout the Marine Park. Thermal stress has likely already been accumulating in the system this year, with Queensland experiencing its second hottest summer (2017/2018), fourth hottest April, fifth warmest winter and third warmest October on record in terms of mean air temperatures. The tropical cyclone outlook from the Bureau indicates that this cyclone season (November to April) is likely to be slightly below average for the Great Barrier Reef. An average cyclone season is up to four cyclones developing in the Coral Sea, and at least one making landfall along the Queensland coast. Widespread flooding is unlikely, however localised flooding can still occur as part of any normal Northern region wet season. Recent reports from the Eye on the Reef network indicate that there are currently minor levels of coral bleaching, disease and damage in the Marine Park. The impacts of Tropical Cyclone Iris (April 2018) in the Mackay/Whitsundays region remain to be verified with in-water surveys. Established and severe outbreaks of the coral-eating crown-of-thorns starfish continue on some reefs in the northern, central and southern management areas. The Great Barrier Reef Marine Park Authority’s Crown-of-thorns Starfish Control Program has been expanded with four new vessels joining the fleet in 2018. These new vessels join the two existing vessels already operating to protect coral in the Marine Park. Trained divers on board these vessels will be culling crown-of-thorns starfish to ecologically sustainable levels on an expanded range of high value reefs in the Marine Park, including in the Swain Reefs where a severe outbreak was identified by the Field Management Program in 2017.